mouse medicine: sepia saturday: do you know the way to san jose? sepia saturday: do you know the way to san jose? today's photos aren't sepia instead they are a few black and white snaps of cars that were once in my family. okay, I have cars on my mind - in a few days I will be off on a road trip with a friend. we are driving from cleveland to san franciso - taking the southern route and crossing our fingers that the weather will be fair. for me the trip is unexpected, I only decided to go at the beginning of this week. going off on this wander is an impetuous decision and undoubtedly will put me behind on a number of projects, but how can I resist an opportunity for a wander with a friend. what more I am looking forward to the chance to cross paths with some buds from the bloggyhood! I can't wait to meet megan and her sibs in l.a. and susan in oakland! it's so strange to have friends one has never actually met!! meeting bloggy friends has always been such a joy, I expect nothing less in the days, months, years to come. my family made a few cross country trips in the chrysler. my folks bought the car in pensacola, florida and in 1956 my folks drove it to san diego, california. but before that they drove me to pennsylvania. I spent a couple months with my grandparents; and then after my parents and brother were settled, nana and dodo flew to san diego to deliver me. in 1960 when my dad was stationed to memphis, my mom, dad, brother and I drove from san diego to memphis. although I was young, I remember this trip like it was yesterday. it was a trip filled with such great family stories: for instance, there was that time we were driving through the middle of the desert. it was summer, there was no such thing as a/c - I was in the front seat sitting next to my mom who was driving; my dad was sleeping in the back seat and my brother was in the back doing who knows what. I started feeling carsick and issued my standard car sick warning proclaiming "my cheeks hurt" - which meant I was going to puke. my brother said "you can't be sick, you're sitting in the front seat. you're such a liar." to wit, I turned and replied "I am not a liar" and promptly puked all over my poor, unsuspecting, sleeping father. ah, the stuff family stories are made of! after memphis we went to live in guam and the chrysler went with us. 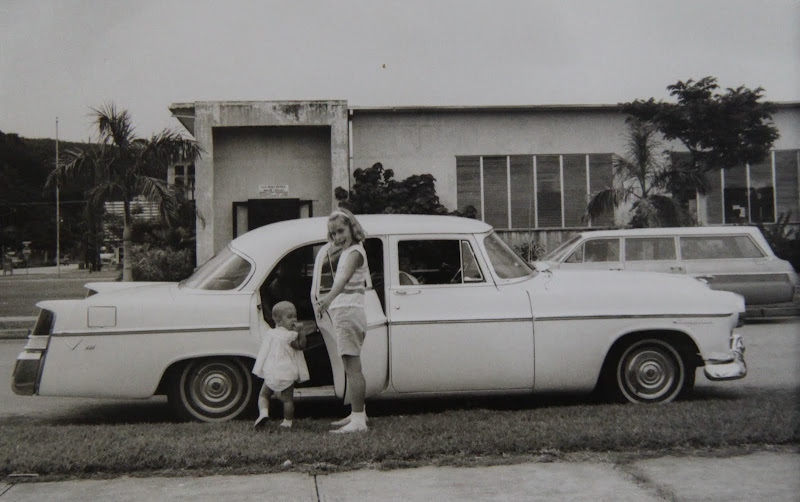 when it came time to leave guam, my folks decided not to bring the car back to the states - they sold it to a local and it lived the rest of its life as an island car. to this day I can picture my car rusting under a coconut tree, home to family of chickens or re-purposed for some other noble cause. even though my dad used to say the chrysler was my car - my favorite cars were the two volkswagons that we had. the first one is seen above - this snap was taken in the winter of 1961 or 1962 and was taken in the driveway of our house in memphis. that is my mom on the left, and nana, my mom's mom, on the right. by the way, it is interesting to note mom never drove the vw's, they were essentially dad's cars. truth me told I don't think she liked driving a stick - and the chrysler was an automatic transmission. 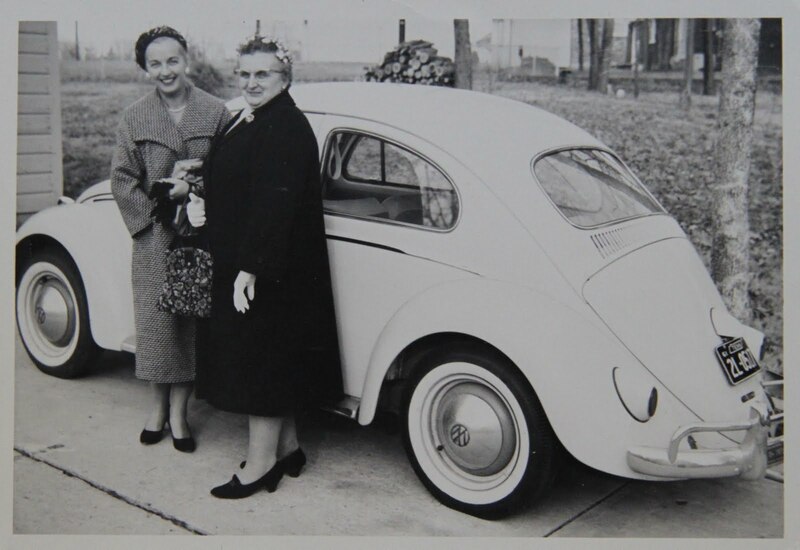 my dad bought his first vw, a bug in 1961 - I loved that little car - there was a "well" behind the back seat and that was where I liked to sit (I'm sure this was a very unsafe place to ride, but safety wasn't a big thing in the 1960s. I loved watching the world out the back window -- not to mention being out of my brother's reach - typical big brother he was both loving and torturous) . when I was in high school my dad bought another volkswagon, that car was a 1966 vw fastback. this car was my dad's car, but if I was really lucky I was able to drive it. unfortunately for it and for me it somewhat met its untimely end while I was driving. okay one more car story. I was seventeen, heading back home after visiting some friends across town one fair fall afternoon as I was going through an intersection - WHAM a young man ran a stop sign and plowed into the car. the insurance company declared the car totaled. luckily no one was in the passenger seat and the only thing truly injured was the car (although I may have been emotionally affected -- for a couple years I had crash nightmares and to this day I have a heightened paranoia about other drivers). my dad had the car hauled to our house and with the money the insurance company paid out, he spent the the next several months repairing and rebuilding the car. he got it back in running order, however because of the blow by that teen-aged boy it never ran well - it always pulled to one side. after a few months he got sold the car to some teenaged boy who didn't care which way the car pulled as long as it mostly went forward. much to my disappointment my father never got another vw. but that didn't really matter, soon I flew the coop. since becoming an adult I've had many, many volkswagons. if I was a car owner still I might still have one. my favorite vw was my 1973 rabbit. one last snap. 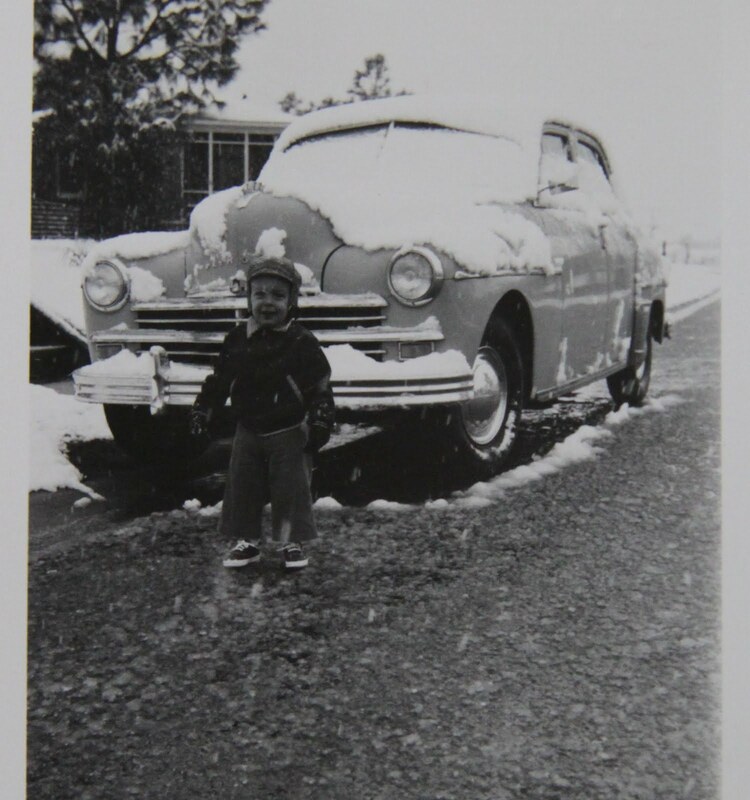 this photo was taken before I was born in 1954, it shows my brother paul in front of what was then the family car. I love this picture because it captures that moment in time and on the back of the photo is a good deal of information. the writing on the back is both my father's and my mother's in my dad's hand is "paul mar 6 -54" in my mother's hand is " Pensacola, Fla First snowfall (like this) in fifty years." well this has been a somewhat different sepia saturday post. I don't know if there will be another post before I hit the road....have lots of ground to cover before I hit the road, but maybe..... if not I'll be back when I'm back. until then be safe. be kind. and have fun!! Your planned trip sounds like a lot of fun. How wonderful that you said yes. Your early car photos reminded me of ours and of the cross-country trips with no seat belts. What fun! I'll be looking for more photos of your road trip when you return. The cars in this post all look very familiar! Great pics and fascinating stories. Safe travels! Hay, you can wax on about things to come, things gone by or any thing as far as I am concerned. Cars always bring back memories for me, I can look at pictures of my fathers' old cars and instantly remember holidays in them. Enjoy your road trip - I want to see 100s of photographs. Safe journey. Don't forget to take your camera. Love that pic of you & your sister & the Chrysler--& I'm very envious of your cross-country road trip--have a great time! Road trips are one of my most endearing childhood memories. Enjoy yours! I enjoyed your photographic car-journey very much. How grand! Have a wonderful time! I recognized you immediately in that first picture! Awww...so cute! Wow..what could be more fun than an unexpected road trip clear across the country? Hope you have a wonderful time and miss all the bad weather that is coming across the north! The weather down here is pretty good right now. sunny warm, robins, crocus'. of course two weeks ago we looked more like the snowy photo! Enjoy your trip! Oh wow what a fantastic trip you have ahead...enjoy the journey...last minute trips are the best...and just think what exciting things you can see in that amount of travel....and end up in such a warm climate. great cars by the way! Very nice post! i just love all the different takes each week...I'm glad I found Sepia Saturday! Wonderful memories. Brings back memories of all the cars my folks had and how they all remind me of a certain place and time. "to this day I can picture my car rusting under a coconut tree, home to family of chickens or re-purposed for some other noble cause."